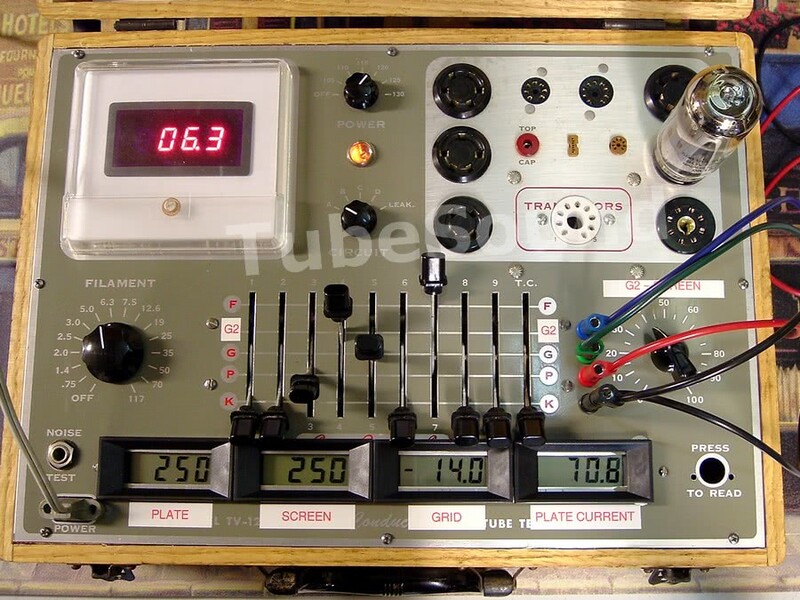 Testing of almost all amplifying tubes (triode, tetrode, pentode, beam power) from antique 4-pin (such as a #10, #45, or #50) through 9-pin novar (such as a 7868). Socket configuration — 4-pin, 5-pin, 6-pin, 7-pin medium (aka 1625), 7-pin miniature, octal, loctal, 9-pin-miniature, and 9-pin novar. 5 digital meters (each better than 1% accuracy, as verified with two Fluke DMM’s) continuously monitor the tube operating parameters. 1 meter for each plate voltage, screen voltage, grid voltage. 1 meter for plate current, 1 meter for heater voltage. Plate current matching at any single operating point, or you could plot a set of curves. heater voltage accurate within 0.1v. My intention was not to replace any vintage tube tester, but instead, to supplement functionality that does not exist in traditional tube testers. 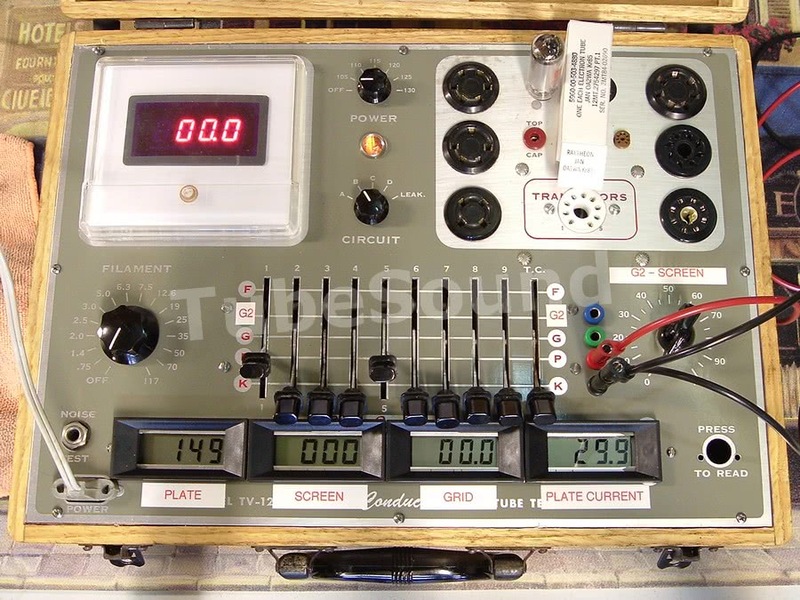 For example, transconductance testing is certainly much easier using the dynamic test of a B&K or Hickok. Likewise, grid leakage sensitivity is best tested in a Mighty Mite or similar machine. But none of those machines recreate the static operating parameters that a tube will see in an amplifier, therefore they do not meet the needs of some tube buyers who want their output tubes matched for idle plate current at the operating parameters of a real amp. Moreover, no standard tube tester will properly test a VR tube and allow you to monitor its performance over its entire operating range. Photos below show testing of a new Sovtek 5881/6L6WGC using two different receiving tube manual examples from 6L6GC “Typical Operating Conditions, Class A1 Amplifier – Pentode”. The third photo demonstrates testing a new 0A2 regulator tube. I have a few cosmetic issues to finish, but otherwise the first model is complete (for now). I have ideas for other features that I may add in the future. 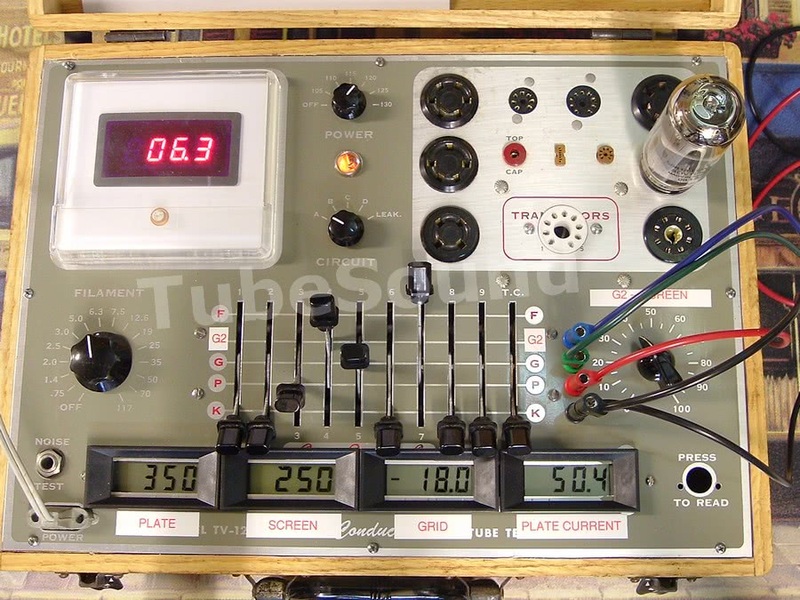 The TubeSound TTM-1, in combination with our classic tube testers, covers a wide range of tube analysis that will meet the needs of sophisticated customers.